Print ISSN: 1460-4140, eISSN: 1758-1036. Triggered: March 2014. 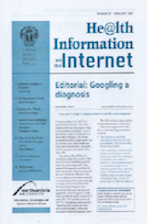 Published by the Royal Society of Medicine, He@lth Information on the Internetceased publication in December 2008. In March 2014, CLOCKSS triggered He@lth Information on the Internet to the public. It is now freely accessible to the public. Royal Society of Medicine announced that it was discontinuing He@lth Information on the Internet, and the CLOCKSS board determined a trigger event had occurred, 45 volumes of He@lth Information on the Internet were made available to the public for free. The volumes were prepared for the hosting platforms by running a process on one of the CLOCKSS boxes that located the three volumes, extracted their content and rewrote the links between them. CLOCKSS preserved each volume of He@lth information on the internet from the Royal Society of Medicine’s website. Volumes 21-66 are now available from CLOCKSS host institutions, EDINA at University of Edinburgh, and Stanford University. The He@lthInformation on the Internet content is copyright Royal Society of Medicine and licensed under a Creative Commons Attribution-Noncommercial-No Derivative Works 3.0 United States License.